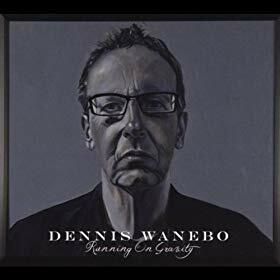 ​Running on Gravity (a typical Wanebo-style allusion, and a typical humor trope) is a solo effort that features Wanebo’s innate sense of musical sophistication and melodic and lyrical nuance. His music, often characterized by lovely harmonies – Wanebo sings particularly effectively in his higher registers, and works well with others – is completely adult in subject and scope, which puts it in this category of subsidiary products. “There are radio-friendly tunes here, such as “Mostly Lost”, and there are ageless sections – “Queen of the Blues” – when no one would know that Wanebo is no 21-year old, but radio is non-existent in the 21st Century anyway and was never smart enough to support a Dennis Wanebo, save possibly for a few early golden years of nascent FM. Rick Rice of RARWRITER.com admires Wanebo greatly, but suspects that commercially speaking he has every reason to make that face he is making on his most recent CD release. We look that way a lot of the time.